The crisis in Egypt is growing in complexity and severity by the day. In the meantime, major Arab states, foremost among them Saudi Arabia, behave as if they have decided to ignore Egypt and its exacerbated crisis. But no one should behave as if Egypt has vanished completely from the map. After all, Egypt is the most populous Arab state and one of the most significant; there is a pressing need for it to return to the regional balance of power. To protect Egypt from the blowing winds of violence and chaos, it is imperative to intervene in order to stop its decline into more political madness. Who has a greater responsibility to intervene than those who contributed to the creation of this crisis in the first place? Riyadh says that Yemen today is the utmost priority and that it is not yet prepared to handle any other issue. There is no doubt that the war in Yemen was a major decision and it simply could not be postponed. It is only natural for the war, which has now dragged on for longer than expected, to become the main preoccupation for the Saudi leadership. War has always been one of the major affairs of the state, of any state, and what Yemen is witnessing is a highly complex war. In addition, the current Saudi leadership, it is argued by some voices in Riyadh, was not the one that welcomed the coup in Egypt and who supported it with tens of billions of dollars. Perhaps it is true that the current Saudi leadership views the situation in Egypt without any positive feelings and may indeed see it as a heavy burden. 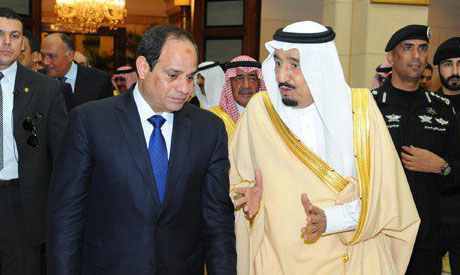 There seems to be some truth to the rumours about muzzled disagreements between the current Saudi administration and Cairo, in contrast to the position of the previous Saudi administration, which saw then-General Abdel Fattah al-Sisi as the deliverer of Egypt. In other words, Saudi Arabia sees the situation from two perspectives, and neither of them is less important than the other: the prerequisites of the war in Yemen and the concerns of Arab regional security. On one hand, as it failed to convince Pakistan and Egypt to make substantive military contributions to the Yemeni war – and although Riyadh does not fully trust the role Cairo would play, or would want to play, in the Yemeni crisis – Saudi Arabia has been keen not to lose any of the war coalition members, regardless of the significance of the member’s contribution. In the middle of war, Saudi officials say, every effort should be exerted in order to gain more friends and avoid losing any friends. If Saudi Arabia were to allow a substantive change in the Egyptian position on Yemen, such a change would have major reverberations across the region. On the other hand – and although Riyadh does not approve of many of the domestic measures adopted by the Egyptian regime – military rule is not a new development in Egypt. During the official talks session with Turkish President Recep Tayyip Erdogan several months ago, Saudi Minister of Defence Prince Muhammad bin Salman said that the Egyptian army has been ruling Egypt one way or another since 1952, and that the current regime is nothing but a continuation of that situation. The prince said that there were states, it would seem, where nothing works but this type of governance. Such a stance, of course, is consistent with Saudi disinterest in democratic changes, whether in Egypt or elsewhere. In addition, the Saudi leadership believes that the interplay of the past four years within the Arab world has led to the collapse of the state and the loss of stability in Iraq, Syria, Yemen and Libya and to a tangible destabilisation in Lebanon and Tunisia. With a population of 90 million, Egypt is the most populous and most central Arab state. Should the state be allowed to fall and should security and stability be lost, Egypt would leave a huge impact on the entire Arab neighbourhood. Consequently, it would become almost impossible to restore security and stability to the region. To sum up, the Saudi leadership views the Egyptian situation through a purely pragmatic perspective, which seems to be free from the ideological delusions of the previous leadership of the late King Abdullah. Today, Riyadh appears to have unburdened itself of the responsibility for what is going on and of what may take place in the biggest of all Arab countries. In fact, such an attitude is neither possible nor acceptable. First, it is not acceptable because states are living and continuing political and legal entities. It is not possible, irrespective of the justifications, to say that the Saudi Arabia of today is not responsible for what Saudi Arabia did yesterday. What Egypt witnessed of the interruption of the march toward democratisation and the coup against the elected government was not just the product of an internal balance of power, notwithstanding the argument about the size of the opposition to president Mohamed Morsi. What Egypt witnessed was also, and perhaps even in a bigger way, the product of a regional balance of power that pushed, with the power of persuasion and the promises of financial and economic support, for the return of the army to power. Undoubtedly, Saudi Arabia and the United Arab Emirates, and to a lesser extent Kuwait, represented the heaviest and most significant weight in this balance. No sooner had the Sisi government held the reins of power than tens of billions of dollars started pouring from the three Gulf states into the coffers of the new regime. Such a huge flow of cash into any Arab state in modern times, during the period from the summer of 2013 to the end of 2014, was a major factor in helping the regime stay. Second, the assertion that Egypt is heading toward stability, and an external intervention may threaten such stability, is not true and does not rest on an accurate assessment of the situation. Egypt today is less stable than it was in the summer of 2013 and even less stable than at any time since the downfall of the Mubarak regime. At the economic level, the Morsi government managed during its sole year in office to elevate all major economic indices in the country and to improve its public finances. Yet, despite the huge foreign financial aid and the rapid cut in economic subsidies (which amount to one-third of the Egyptian budget), Egypt’s economic situation continues to deteriorate further and further. At the political level, most of the 3 July, 2013 roadmap promises remain unfulfilled. Today, the Sisi’s regime stands almost without any of its early allies who provided it with the illusion of political legitimacy. Anti-regime demonstrations have continued since the summer of 2013 despite the apparent division within Egyptian society. It is only the ruthless crackdown by security agencies and the complete capitulation of the judiciary, which is protecting the regime from wide-ranging political explosion. At the security level, state violence perpetrated against the people and loss of hope in the future have led to the eruption of an armed opposition in Sinai, as the Peninsula has turned into what resembles a war zone. In the meantime, other parts of the country are witnessing varying levels of armed opposition and bombings. Third – and here is where the Egyptian crisis is more flagrantly revealed: against the backdrop of the regime’s realisation of its predicament, it has started to pursue a series of bloody repressive measures that is about to reach its height. The regime has moved from issuing heavy sentences against peaceful protesters and vengeful sentences against the January revolution activists, to organising kangaroo trials for the leaders and cadres of the Muslim Brotherhood, including former President Mohamed Morsi himself. It has also moved from issuing life sentences against a large number of leaders, to issuing a series of death sentences against high-ranking Brotherhood leaders and Morsi. Escalating violence across the country is a classic escape policy resorted to by oppressive regimes, especially when the are faced by popular mistrust and opposition. This is exactly what Egypt is witnessing. If such sentences were carried out – a development that cannot be ruled out – the country would slide into a deep abyss. Thus far, the overwhelming majority of the regime’s opponents, both Islamists and non-Islamists, are keen to avoid violence and the use of arms. But who would be able to restrain them should the regime continue to escalate the level of official state violence? Saudi Arabia and the other Gulf states, which contributed to the creation of this crisis-ridden situation, are responsible, and their responsibility obliges them to intervene in order to rescue Egypt from its own self. Dr Basheer Musa Nafi is a historian studying Islamic and Middle Eastern History. This article was first published by the Middle East Eye.